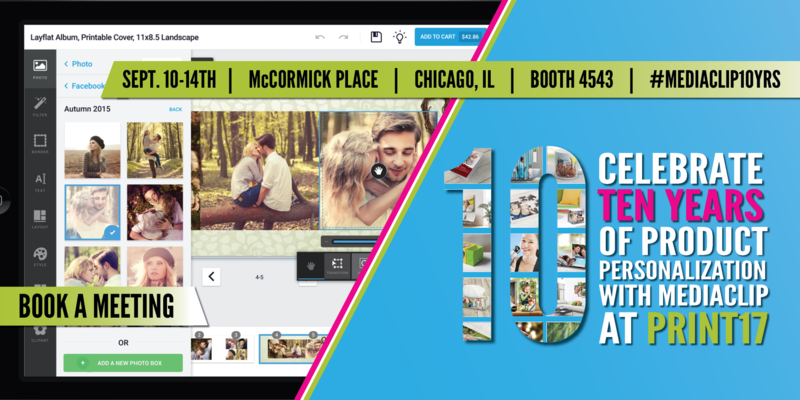 Mediaclip, a leading developer of product personalization software, will be exhibiting in booth 4543 at PRINT 17 in Chicago, IL (Sept. 10-14th at McCormick Place). Attendees can expect to get a glimpse into Mediaclip’s 10-year metamorphic journey as the staff discusses how it all began and how the company earned its status as the leader in product personalization software development today. Mediaclip, a leading developer of product personalization software, will be exhibiting in booth 4543 at PRINT 17 in Chicago, IL. The event will take place at McCormick Place from September 10th – 14th. At the trade show, the company will be presenting the newest innovations of its state-of-the-art software, as well as sharing industry expertise in creating market opportunities within the booming product personalization market. The fact that any type of printable material can be personalized offers a unique chance to spark conversations with creative PSPs who are willing to bring product customization to the next level with Mediaclip. To learn more about how offering product personalization can boost your sales and increase your production volume, please book a rendezvous (http://ow.ly/wuZr30ezlp8) to meet with Mediaclip’s team in Chicago. As a gift for helping celebrate this important anniversary, booth visitors will receive an exclusive savings offer; details regarding this will only be provided onsite by the staff. If you will not be attending PRINT 17 but would like to discuss business opportunities with Mediaclip, please feel free to reach out via email at info@mediaclip.ca, or call 1-877-799-2547 (toll free).